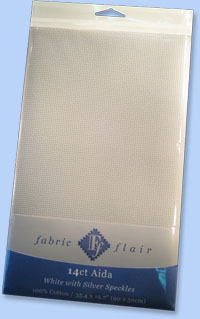 We are excited to announce that we are now distributing Fabric Flair! We will be carrying Fabric Flair's top selling fabrics to start, but we will be expanding the line over time including exclusive colors! Fabric Flair's Aidas, Evenweaves, and Linens will be available in 39"L x 35.4"W cut in pre-packed retail hanging bags*. Half cuts will also be available in Evenweaves and Linens. Fabric Flair has been supplying the best choice for combined quality, range & price to stitchers in Europe & Australia for over 20 years. With the next generation they have expanded to the USA. Their range of needlecraft fabrics is the largest in the world, and their technique of creating hand-dyed effects and patterned fabrics is the most eco-friendly on the market, using less than 1% of the dye of conventional hand dyeing. They have worked with several well known designers to create unique and exciting patterned fabrics that work to enhance the designs, and offer stitchers something they haven't seen before. Their range includes silver sparkles, a colorfast sparkle that shimmers beautifully. Woven in exclusively European mills, imported and finished in Massachusetts USA, their range of aida, cotton and linen evenweaves are among the finest in the world.